Snap off tough ends of asparagus spears. In 12-inch skillet or 4-quart Dutch oven, heat 1 inch water to boiling. Add asparagus. Heat to boiling; reduce heat to medium. Cover and cook 4 to 5 minutes or until asparagus is crisp-tender; drain. In small bowl, mix maple syrup, mustard and oil. Drizzle over asparagus. Honey can be used instead of the maple syrup. Not sure about asparagus? Check out these five yummy and easy ways to prepare it. If you have never tried making this spring vegetable, you are in for a treat. Not only is asparagus delicious, but it is also incredibly simple to make. 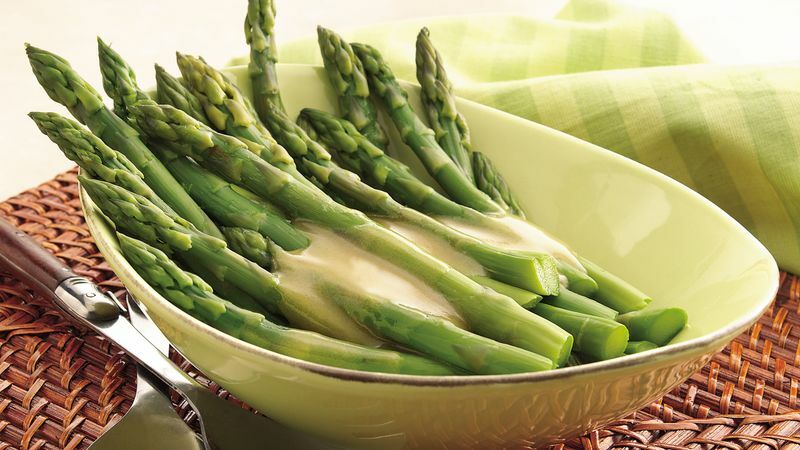 Grill, steam, roast, or poach … you can cook asparagus almost any way you can imagine. No matter how you decide to cook your asparagus, you must prepare it first. Break off the ends of the stalks where they seem thick and woody. The easiest way to do this is to bend them about two inches from the end of each stalk and snap off the end where it breaks away easily, leaving you the tender, green stalk to cook. Wash the asparagus in lukewarm water and shake them dry. Once this is done, you can get cooking. The fastest and simplest way to cook asparagus is to boil it. Place the stalks into a saucepan — you can cut them into smaller sections, if you need to — and cover them with cold water. Bring to a boil and toss in a dash of salt and sugar. Reduce the heat to medium and continue boiling. Cook the stalks for three to five minutes, or just until fork tender. Remove the asparagus from the water and add a pat of butter. Salt and pepper to taste. If you have a steamer, you can do the same, but steam it instead of dropping it in water. Whether you fire up the barbecue or just plug in your Foreman, grilling asparagus produces a delicious hearty flavor. After washing and breaking the asparagus, place it in a bowl or zip-top baggie. Pour in some olive oil and toss to coat the stalks. Place on the grill and season with salt and pepper or your favorite herbs and spices. Grill over high heat for three to five minutes until tender, turning once halfway through. If you think you don't have time to make asparagus, head on over to your microwave. You can make tender, steamed asparagus in a flash. Snap your asparagus and wash it, but don't allow it to dry. Instead, place it right into a microwave-safe dish. Cover the dish with plastic wrap, leaving a small corner open to vent. Microwave on high for four minutes. Season as desired and enjoy. Roasting, as with most vegetables, gives asparagus a rich, nutty flavor. Preheat your oven to 400°F. Place spears in a baking dish and drizzle them with olive oil. Sprinkle with salt and pepper or any seasonings you choose (garlic powder adds a fun kick). Roast for 10 minutes until fork tender and lightly browned. Squeeze a lemon half over them for even more flavor. Finally, you can sauté asparagus for a quick, appetizing side dish. Place washed, snapped spears into a bowl and drizzle with olive oil. Season with salt and pepper or toss some minced garlic into the pan as well. Heat a skillet over medium high until hot and then add the asparagus to the pan. Resist the urge to stir the veggies, allowing them to brown on one side. This usually takes three to five minutes. Flip the spears over and brown the other side. Remove from heat and enjoy. After trying asparagus using any of these methods, be sure to sample it a totally different way too. You might think steamed asparagus is just okay, and then absolutely rave over the grilled version. Try it then tell us … what's your favorite way to make asparagus?